The Global Elite Series (GL) family of hot tub control systems were designed using Balboa's patented M7® temperature and water flow sensing technology and a new universal control platform. These features increase the reliability, ease of installation and serviceability of the control. Innovative features include having output connectors on-board, which eliminates a maze of wires in the enclosure and ultimately reduces assembly time and margin for error. The systems have a plastic enclosure to eliminate water intrusion. Connectors are built on to the circuit board minimizing wires and simplifying service. The different models have controls for a single two-speed pump or an additional blower or pump. All models feature a power supply that is wired for 230 volts, a 1.0, 2.0, or 3.0 Kw heater and support ML panels. The GL family is based on a common universal control platform, which increases feature flexibility while reducing installation and configuration problems. The units incorporate Balboa's patented M7® temperature probe technology, which eliminates the more failure prone pressure switches and simplifies the installation process by not having to drill additional holes in the spa. With over 2 million controls in the spas worldwide utilizing the M7® technology, the GL series of spa control systems are built using M7® and deliver maximum performance and satisfaction. 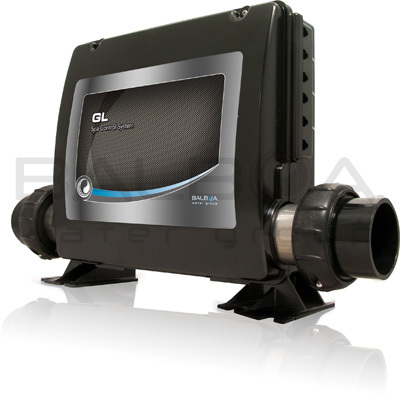 The GL series is a universal control platform, increasing feature flexibility and reducing configuration headaches. With this combination of our patented M7® temperature and water flow sensing technology, BWG leads the industry in quality and reliability.